Review by Willie Caldwell of A Funny Thing Happened On the Way To the Forum: Cincinnati Shakespeare Company. 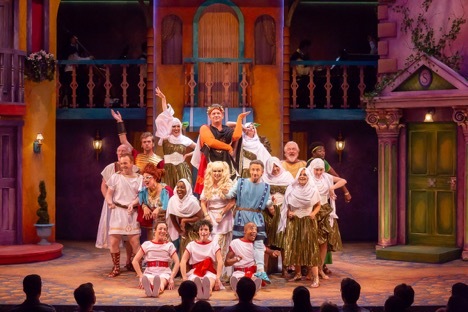 Cincinnati Shakespeare Company kicks off their 25thAnniversary Season by presenting their first fully staged musical, none other than Steven Sondheim’s, A Funny Thing Happened On the Way To the Forum. Originally opening on Broadway in 1962, Sondheim’s musical farce is based on works by the ancient Roman playwright Plautus and tells the story of young love, family loss, mistaken identity, and throws in a fair amount of cross-dressing for good measure. The fast-moving, highly energetic production takes full advantage of the Otto M. Budig Theater with action spilling into the aisles and weaving throughout the audience. Director Brian Isaac Phillips has brought the production into the 21st century by including bits and gags that incorporate modern technology and pop culture references that are sure to land well with audiences of all ages. The production is supported by a tremendous cast who prove they are adept with slapstick musical theatre as they are with classic Shakespearian texts. The dynamic duo Pseudolus (played by Matthew Lewis Johnson) and Hysterium (played by Jeremy Dubin) drive the story forward through a series of mishaps and ill-formed decisions that keep audiences laughing. The duo is delightfully balanced by a pair of young lovers played by Courtney Lucien and Kelcey Steele who desperately work to overcome all odds in hopes of ending up together despite the best efforts of the suave Roman captain, Miles Gloriosus (played by Gabe Wrobel). The sizeable cast is rounded out by three bumbling Proteans (played by Geoffrey Warren Barnes II, Sara Clark, and Caitlin McWethy) and capped off with a pack of singing and dancing courtesans owned by the succulent flesh peddler Marcus Lycus (played by Darnell Pierre Benjamin). The colorful cast of characters spends close to three hours singing, dancing, and working their way into the hearts of the audience who are along for every step of the ride. Vocally, the cast works hard to create a rich sound full of character and energy which is accompanied by a full 10-piece orchestra including piano, upright bass, brass, reeds, strings, and percussion. While the balance of the orchestra is sometimes a bit muddled, the music underscores more than 15 numbers with the orchestra elevated up stage. Adding to the experience is the masterful scenic design by Shannon Robert, lighting design by Adam Zeek, and costume design by Brian Horton. The technical elements of the show lend a brilliant use of color and excitement which even includes a live water feature on stage. Cincy Shakes‘ first foray into musical theatre is a delightful romp that will keep audiences laughing and humming along. Save the tragedy for tomorrow and come out for comedy tonight. This was written by Sheldon Polonsky. Posted on Saturday, September 8, 2018, at 9:34 pm. Filed under Stage Insights News, Stage Insights Reviews. Bookmark the permalink. Follow comments here with the RSS feed. Comments are closed, but you can leave a trackback.